CPF to help fund our retirement but what about our parents'? I am a new reader to your blog and have benefitted greatly from the nuggets of wisdom that you have shared within these first 2 weeks of reading your blog. Because of your blog, it got us started thinking abt our parent’s cpf as well. We realised that our parents cpf balances are very dismal. Each one has less than $10,000. We are hoping to top up their RA until it hits $30k eventually. However, they have the option of choosing between the old retirement sum scheme or the current cpflife. The draw of the retirement sum scheme for me is that the 6% earn still belongs to my parents but under cpflife, once it is under the annuity, the 6% goes to a common pool for the gov to maintain this plan. Could you talk to yourself and share what your through process would be in such a scenario? CPF Life is attractive because it pays us a monthly income for as long as we live but it is an insurance product and, so, it is about sharing risk. Some people think they won't have a long life and brush aside CPF Life but, statistically, people are living longer. How younger CPF members get 6% a year? 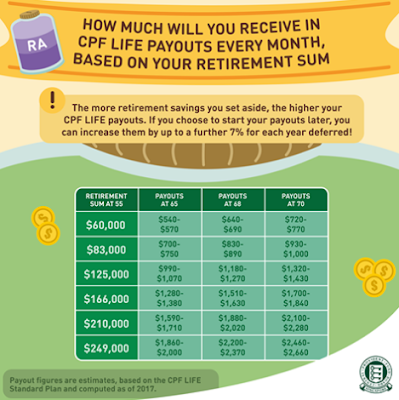 Build a cornerstone in retirement with the CPF. Am interested with one of your readers talking about topping up mum's RA for CPF Life and "buying" over dad's RA. For my case - my parents are both 75 nearing the 80 age cap of choosing from the old scheme to CPF Life. Problem as usual, there is no older AK Shifu to talk to himself during their younger days and that's why their situation is having a demure CPF funds inside. 1) Should I be topping up their RA or SA? 2) like our SA is there a topping up limit. Like the VC cap (per annum case). 3) I guess have to hit their FRS before the CPF Life works for mum case? But reader was just saying a top up of like till $30k? 4) lastly, while above is still pending. The reason why their CPF is little is due to the accured interest and the outstanding OA "loan". 1. You can only top up their RA. At their age, top up to SA is not allowed. 2. You may top up their RA to the prevailing BRS if they can pledge their fully paid flat. Need not top up to the FRS. 3. My understanding is that CPF Life pays out automatically from age 70. As your parents are already 75, it could be that CPF has started paying them a monthly sum under the old scheme. Check with CPFB. 4. Well, if their flat is fully paid for, at their age, it doesn't matter anymore. Thank you Shifu for taking time off to talk. Will take my parents down to CPFB to understand more on this. Item 2) there is another scheme under HDB lease buy back. It may affect that option if choosing the BRS pledge. hello, can we still do annual topup to cpf after we turn 55? After you turn 55, you cannot top up the CPF-SA but you can top up you CPF-RA if it has not hit FRS.